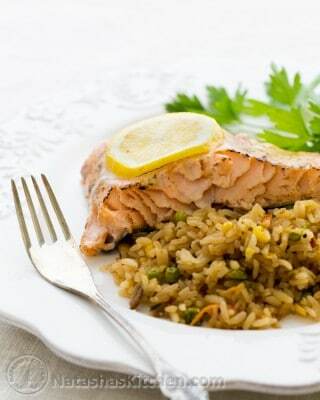 This salmon has a well-seasoned, tangy crust and it's just right and way too easy to make! Preheat the Oven to 350˚F for 20 min. Line a large rimmed baking sheet with parchment paper for easy cleanup. In a small ramekin, combine 1/2 tsp salt, 1/8 tsp sugar, 1/8 tsp black pepper, 1/8 tsp garlic powder, 1/8 tsp paprika and mix. Sprinkle the top of your salmon evenly with your seasoning mix. Spread with a thin layer of mayo. It really just needs a little. Don't slather it on. A little goes a long way with Mayo. Top with slices of lemon. Cover with foil and bake at 350˚F for 20 min. Remove foil and broil a 3 minutes or so to get a nice golden crust on the top.